On a hot and humid day, maybe it's a better idea to pick a water park instead of a theme park. With long waiting lines in the sun or shade, you'll probably start to sweat in no time. Theme parks like Animal Kingdom and Busch Gardens hardly use air-conditioning, so you'll find that out soon enough. :) Both Animal Kingdon and Busch Gardens have several misting areas, but still too few on hot days. Better cool off in a water park with tons of attractions, lazy beach chairs and large pools! You're lucky, because in the Orlando area, there are enough water parks to choose from. If you're not to fond of all those water attractions but still love to cool down in the water, it might be more fun to snorkel between the fishes or swim with dolphins at Discovery Cove. Keep in mind that attractions or complete parks can be temporarily closed with bad weather in the area. And thunder and lightning can be heard in Florida almost each day. Universal's Wet 'n Wild is a water park on the intersection of International Drive and Universal Blvd and has about 14 attraction water slides of which six are multi-person. The latest ride is called Brain Wash™: "A clean brain is a happy brain. Take a mind-altering trip on this four-person tube ride with a 53-foot vertical drop into a dark, swirling, domed funnel. It’ll leave your brain sparkling clean and ready for more." Lockers and towels can be rented at Wet 'n Wild. This park also features the ExpressPass, with which you can reach the end of the line more quickly. 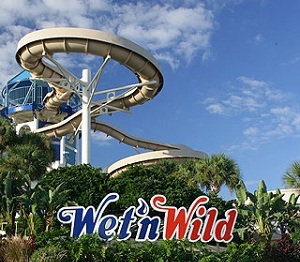 Wet 'n Wild is opened year-round. Wet 'n Wild closes permanently on the 31st of December 2016. Reason: new water park Volcano Bay opening in 2017 (nearby location). 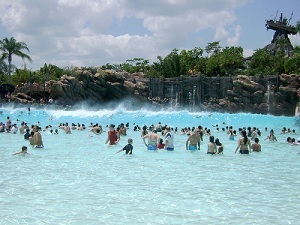 Blizzard Beach is one of the two water parks at the Disney World Resort. 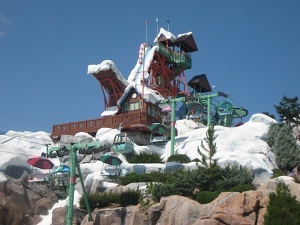 It's a melting skiresort-themed water park with several colored slopes and compared to Typhoon Lagoon it has got more thrill rides. It's the more adventurous one of the two. Most of the major attractions are hosted on top of Mount Gushmore, which can be reached by stairs or by chairlift. Just like Typhoon Lagoon, Blizzard Beach also has a relaxing Lazy River surrounding the park and it's attractions. Lockers are available for rent. Typhoon Lagoon opened in 1989 and is the worlds most visited water park. It's theme is that a typhoon has wreaked havoc on a silent tropical island. Fish gear, surf boards and ships are all over the place, with the ship 'Miss Tilly' stuck on Mount Mayhem. The park features the largest wave pool of the USA, I can tell you those waves are powerful! If you are with smaller children, be sure to hold them when waves hit. The park features severeal slides and pools and also contains a lazy river, just like Blizzard Beach. Lockers are available for rent. Aquatica opened up in 2008 and is located next to SeaWorld. The park has a south Pacific theme and has a lot of slides and also features two wave pools. Just like the wave pools, the lazy rivers come in pairs, the water park has got two lazy rivers of which one is a faster, more aggressive version (Roa's rapids). 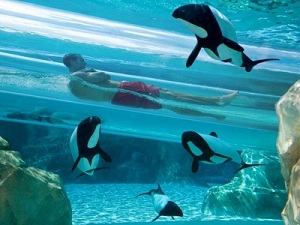 'Dolphin Plunge' is the park's signature attraction; two tube slides pass through a pool with Commerson's dolphins. If you are lucky, you can spot them. Lockers and towels are available for rent. This Lego-themed water park is smaller than the other water parks mentioned above. It features several slides, a wave pool, build-a-raft lazy river and a interactive playground amongst others. Lockers and towels are available for rent. The water park admission is only $20, but the downside is you have to buy a Legoland theme park ticket, because that is the only way to enter the park. 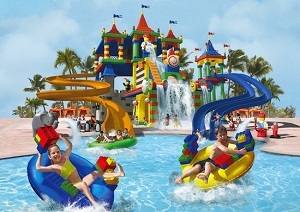 The water park is located in Winter Haven, about a 45 minute drive from the Kissimmee/Orlando area. Discovery Cove is operated by SeaWorld and is an all-inclusive theme park, where visitors can interact with bottlenose dolphins, exotic birds, tropical fish, rays and other mammals. 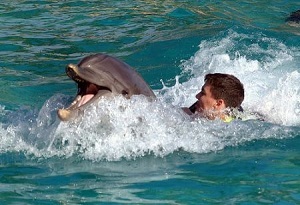 You can relax on one of the beaches, feed birds in the aviary, snorkel between the fish and much more. Food, drinks, locker rental, sunscreen sample and beach chairs are all included in the admission price. To keep crowds down to give you the best experience, the park allows up to 1,300 guests to enter the park. Therefor, a reservation is highly recommended. Packages also come with unlimited admission to SeaWorld and Aquatica. The park itself isn't that big, but it's an absolute must to spend at least one day here. I've been to Xel-Ha in Mexico (near Playa del Carmen) which is much bigger, still this is a must do if you like swimming and snorkling. The 'Grand Reef' isn't that big though, but really beautiful (and cold). Watch my video on YouTube.